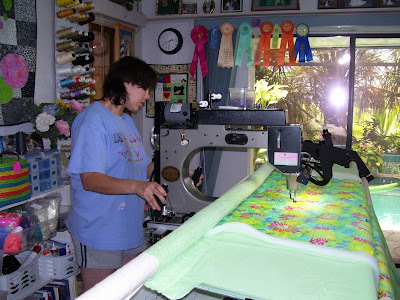 Rags N Quilts: Kelly's longarming! Today, Kelly asked if she could quilt. I said you want to what?? First time interest, so we took advantage. No time to piece, so we picked a pretty piece of fabric from my stash for the top ; and a piece of one of my hand dyed fabrics for the back and loaded them. And she was off and running. We got about 1/2 done before the kids got up from "rest period" and wanted back in the pool. And it looks great!! So, we'll finish it tomorrow. And who knows, maybe we'll get to do another before they leave next week. You know, plant the seed! She's really concentrating, but she is also having fun! It's a great visit. And the girls are having a blast in the pool. Tomorrow, we'll be hanging out swimming and quilting. Sunday, we go to Mote Marine for the day. 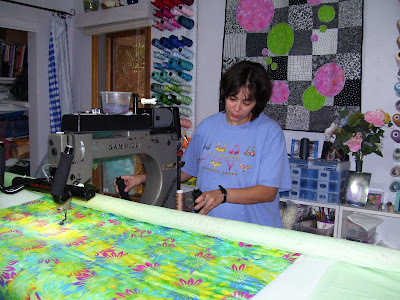 Wow - Kelly quilting - that's a surprise but then maybe not - it's fun using the longarm isn't it? ?